Modiin was built on the site of the ancient Hasmonean dynasty capital. It was in 1993 that the modern city of Modiin (or Modi’in) was founded during the premiership of Yitzhak Rabin. With Haim Bibas as its mayor, Modiin is one of the youngest and fastest growing cities in Israel. The renowned architect Moshe Safdie designed the layout of this ‘planned city’. He ensured that green spaces comprised 50% of the layout. This makes Modiin-Maccabim-Re’ut an ideal city for young families and their parents to live. Modiin thrives on its diverse population. Modiin has a mixture of religious and secular, immigrants and Israeli born. They live in complete harmony with each other. Modiin feels like the center of the Jewish world where Jews of all ages and opinions can live as one close and integrated family. Transportation is another of the great advantages of this unique city. Modiin is situated midway between Tel Aviv and Jerusalem. The city is within easy reach of both and yet benefits from being away from those bigger metropolises. Major roads include the road 6 toll road, the 431-highway bring Rishon Le Zion and Rehovot within easy access. Also highway 1 and the 443 road lead to Givat Zeev and Jerusalem. 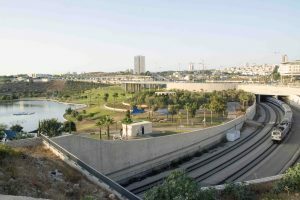 The city is the terminus on the Nahariya – Modi’in inter-city train line and only minutes by train from Ben Gurion airport. There is an extension being built to Jerusalem. With such a diverse population and with such easy access to all of Israel, Modiin is truly the center of Israel. Modiin has a population of almost 100,000. The town was planned in two stages. The first to reach a population of 125,000 and the second stage to have approximately 250,000 residents. Modiin is a town designed to merge with its topography. A delightful town abundant in green public parks and magical hills and valleys. A city which is enchanted with delightful architecture and has spectacular views of open countryside. The city is blessed with a comfortable climate. The climate is not as humid as the coast and is warmer than Jerusalem in winter time. Modiin is divided into four major areas: residential, light industrial, main business centers and a technological park. In each residential area there is a small shopping center to serve the local residents. The youth of Modiin grow up with an abundance of high quality schools. These schools include extra curriculum activities offering them optimum chances to develop to their full potential. Included among Modiin’s youth are up and coming scholars, successful sports people, promising musicians, religious leaders. In fact there are talented young residents in almost every field of Israeli life. Modiin has statistically had one of Israel’s most highly motivated recruit rates for joining the Israeli army (IDF). Many go on to become pilots, join special units and many of those continue to remain in the army as a career choice. Modiin has had two chiefs of general staff as its residents. One, Moshe Bogie Ya’alon later became deputy prime minister. There are many other exceptional people who are in very high positions in Israel life who chose to live in Modiin. In fact, most of our Modiin resident clients decide to remain in Modiin. Quite often hen they want to sell their Modiin properties they tend to buy again in Modiin. This is a strong marker to convince us that Modiin is a wonderful vibrant young town. This vibrant city is destined for an exciting future of growth and enormous development. Modiin is a perfect town to choose to live in and raise a family. 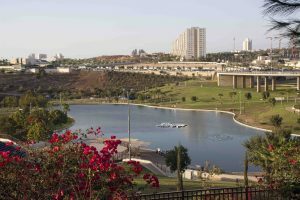 Modiin Macabim Reut is also an incredible town to invest in the Israel real estate market.